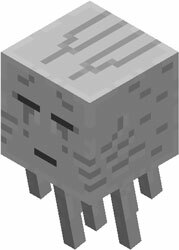 Ghasts are hostil beings who fly over Netehr’s dimension. They have grey body and it’s body is 4×4 blocks. They have the legs as long as a Minecraft player. They move with closed mouth and eyes, but open both when they want to attack a player. They make an special sound which is quite bothering, it is similar to an inverse meow of a cat. They have a powerful attack because they have a big mobility. Its rang attaci is about from 100 blocks from the objective and the attack is enough to make the player burn. The difference from other Minecraft hostil beings is that the Ghasts won’t follow you, they just will throw their powerful attacks from the distance.